It is officially spring, which means that I can officially make my Spring Breeze! This cocktail is perfect for a nice spring day. There is something about a cocktail in a martini glass being this color, usually from the cranberry juice, that makes me want to drink it up....fast. I just love the color of this fun cocktail. The weather here has been so back and forth I never know from one hour to the next how the day is going to play out. I find myself looking at my weather app to "try to" plan out the week. Then reminding myself that whatever I am seeing on my app right now most likely will not "really" be what the week will be weather wise. I've been so confused on whether or not it was going to rain this week, then if it is supposed to....when? At least I know it's not raining right now and my daughters softball game is still on! So we survived Easter! How was yours? Did you celebrate Easter, Greek Easter, nothing at all? Better question, Did you have a cocktail?? Easter this year was actually one of the easier Easters we've had. We made it easy. Bought a ham from Costco. Stick it in the oven. Done. I made my homemade creamy mashed potatoes ahead of time. Done. I made my DELICIOUS creamed corn in the slow cooker in the morning. Done. My husband made his brussel sprouts right before dinner. Done. I was able to sit, chat, relax and enjoy a couple cocktails with our guests! I looooved it!! Tonight's cocktail is pretty simple to make. There is not a whole lot of ingredients, which is nice because it gets you THAT MUCH closer to enjoying your cocktail! See how simple that was?? Oh and don't forget the MOST IMPORTANT step of all. Isn't the color of this cocktail just fantastic? I just love it. So much that I should probably make another one. With these simple ingredients right here! There you have it. It's just that simple. It's just that delicious! That drink looks amazing! It was 78 degrees here in Denver today, so I mixed up Italian soda with some gin. Your drink, I believe, sounds like what I'll be drinking this weekend. Looks delicious! 78? Nice! We get 70's and then 50's all in the same day sometimes, so annoying! I still need to try Italian Soda cocktails! Cheers! I love the name of the cocktail. It's so pretty! The color is so perfect for spring! It's so frustrating!! Yes, waking up and stepping outside is what we've been relying on too, lol! Cheers! So nice to have an easy go to a holiday, right? 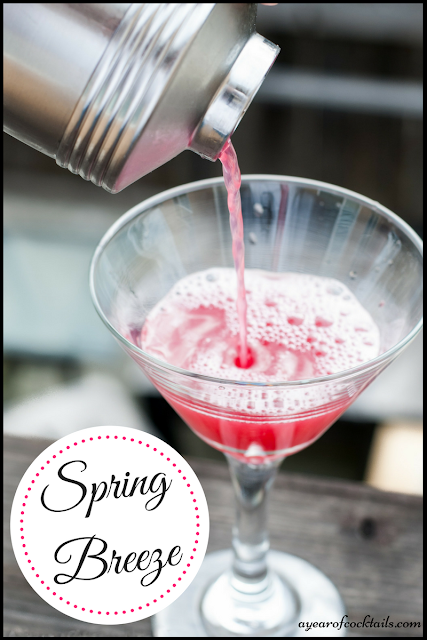 This cocktail looks so festive (especially for the warmer weather) and sounds fab! Cheers! This sounds like a vacation in a glass - I love it! And such a fresh, pretty color too! Ohhh,that cocktail looks and sounds like it would taste amazing! These colour drinks are definitely my favourite too! Can't beat a cranberry based cocktail in my opinion.